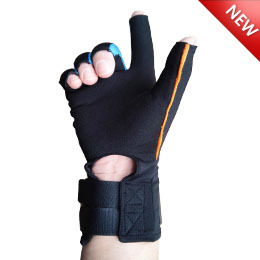 WiseGlove is completely new design of motion capture data glove, it real-time measure finger joints movement Angle. It uses a proprietary optical fiber sensing technology to accurately transfer the motion of the hands and fingers into real-time digital joint Angle data. The WiseGlove motion capture system has been used in a wide variety of real-world applications, including digital prototype evaluation, virtual reality biomechanics, and animation. The WiseGlove data glove is constructed with stretch fabric for comfort and a mesh palm for ventilation. The 18-sensor motion capture WiseGlove system includes open fingertips, which allow the user to easily type, write, and grasp objects. The 5-sensor data glove features one bend sensors on each finger. The 14-sensor data glove features two bend sensors on each finger, four abduction sensors. The 15-sensor data glove features two bend sensors on each finger except that three bend sensors on thumb, and four abduction sensors. The 18-sensor data glove features three bend sensors on each finger, except that two bend sensors on thumb, four abduction sensors. Each sensor is extremely thin and flexible being virtually undetectable in the lightweight elastic glove. The 19-sensor data glove has three flexion sensors per finger, four abduction sensors. Each sensor is extremely thin and flexible being virtually undetectable in the lightweight elastic glove. The basic WiseGlove data glove includes one motion capture glove, one batteries, a battery charger, and a USB/wireless technology adaptor with drivers. Many applications require measurement of the position and orientation of the forearm in space. To accomplish this, mounting provisions for InterSense, Polhemus, and Ascension six degrees of freedom (DOF) motion tracking sensors are available for the data glove wristband. Tracking sensors are not included in the basic WiseGlove system.